I had a change of mind. 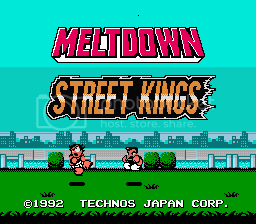 I like Meltdown as a translation of Nekketsu and when you combine it with Downtown, it works even better as a title. Loving that title screen! Meltdown works better as a translation of "nekketsu" than I would've expected too. I second Meltdown. It just sounds cool. Aside from the fact that it brings someone having a mental breakdown to mind more than someone being hot-headed and always getting into fights. I think the problem here is that there really aren't many good synonyms for hot-headed. But, frankly, Hothead is as good a localization as you're likely to find. It conveys more or less the same meaning and is appropriately "cartoonish" sounding. What about Breakdown Street Kings? See? This is what "Meltdown" brings to mind. And that's NOT what 熱血 means. Honestly everything doesn't have to be so literal and rigid. Having something "literal and rigid" is one thing. Using a word in a language in a way it isn't meant to be used is completely different. You're making up your own usage of a word in the English language, when you could easily find a word that shares meaning with 熱血. How about "brawler" or "brawler high school"
Something like Brawl School, keeping in with the whole alliteration theme..
How about "Pugnatious Street Kings"? To be honest, I think the PAL title for River City Ransom is a good building block for various games; "Street Gangs". Maybe go all over the franchise and do Crash N' The Boys -- and throw in some subtle Scott Pilgrim love while you're at it, 'cause I say so. Could of course also try to build on the River City name, since that's totally the one most people associate with the franchise -- other than maybe anyone who sees all games as "those other games that looks just like Nintendo World Cup". Maybe it's the non-native speaker in me that just finds "Hot-blooded" to sound a bit strange/stupid. In general, I like to consider most things expendable as long as a suitable alternative can be found and its usage is thought through. "Douchebags -> Douchebag Soccer -> Feudal Douchebags"
Downtown Nekketsu Monogatari / River City Ransom ---> OK! This. I like this. Would be great is someone did all these title screen hacks! How about Kunio vs. River City High ? I don't see the point in localizing as "River City etc." and keeping the Japanese character names. Also, I think the street tuff aspect should be kept in naming the games and ditching the extracurricular sounding "club" titles. Perhaps Ice Brawl, Dunk Crew, etc. Honestly, I've mulled over the idea of using Crash n the Biys as a basis and doing a franchise wide rebranding.